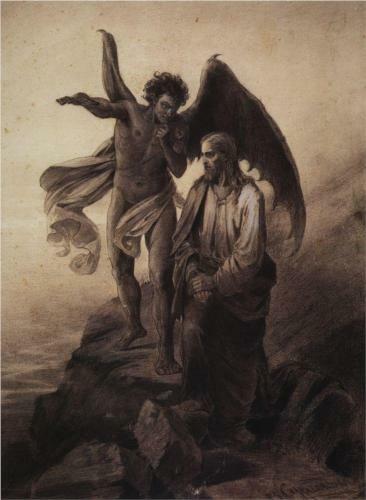 Temptation of Christ by Vasily Surikov, St. Petersburg, Russia, 1872. For you Blog readers, I thought to provide three art works, each of which I used in the Bible Study episode on St. Luke’s version of the same events (Episode Sixteen), with more commentary about the work and the artist than was used there. For the offering of bread to assuage Jesus’ hunger after his 40 days of fasting, I offer the dark, foreboding interpretation by Russian artist Vasily Surikov, which now hangs in a gallery at St. Petersburg, Russia. Surikov, considered the greatest 19th century Russian painter of historical scenes, attended the Imperial Academy of Arts at St. Petersburg from 1869 to 1871. He died at Moscow in 1916. 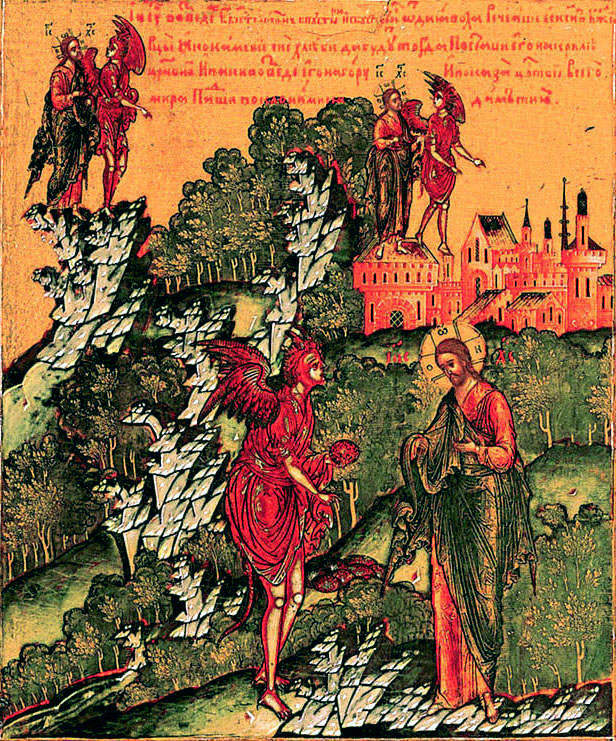 Russian Orthodox Icon, part of a panel of scenes depicting the Temptation. Painted circa 1652. For St. Matthew’s version is this Scriptural quotation in NKJV text: “And the Devil said to Him: ‘If you are the Son of God, command that these stones to become bread.’ But He answered him and said, ‘It is written, “Man shall not live by bread alone, but by every word that proceeds from the mouth of God.”” The quotation is from Deuteronomy 8:3. For Christians, we understand that the “daily bread” for which we petition in the Lord’s Prayer means those things which are essential for our survival, including access to the word of God (both literally, as Scripture, and spiritually, as St. John wrote, through faith in the Word of God, Jesus Christ. The second Temptation finds Jesus taken by Satan to the roof of the Temple. Satan offers a parody of Psalm 91:11, 12, the source of both Jewish and Christian belief in the Guardian Angel. If, he says, Jesus will just throw Himself off the roof, He will be protected by angels: “He shall give His angels charge over you…In their hands they will bear you up, lest you dash your foot against a stone.” Jesus replied, again citing a verse from Deuteronomy (6:16): It is written, ‘You shall not tempt the Lord your God.” Those who believe in the Guardian Angel understand that while we believe in his power to protect, we cannot and must not ever place ourselves in danger, effectively taunting God, through the Guardian Angel, to protect us from our own folly. 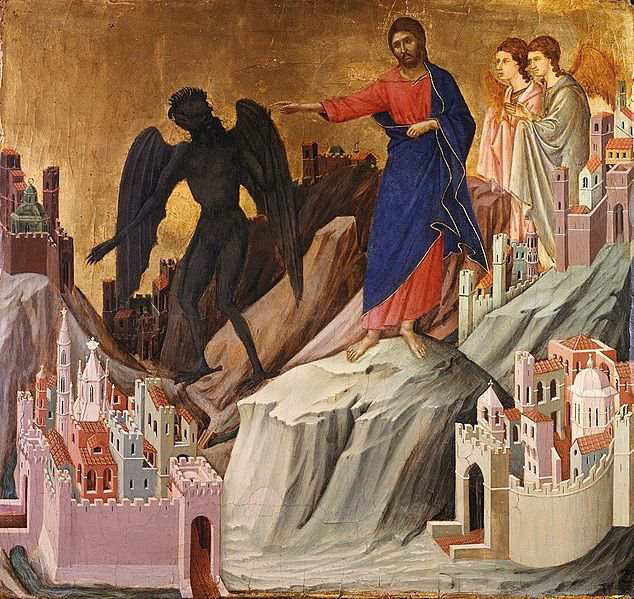 The Temptation on the Mountain, egg tempera and gold leaf on panel, Duccio Buoninsegna, 1308-1311. The illlustration is a very fine Eastern/Byzantine style painting done in egg tempera with gold leaf on a wooden panel. Duccio is known as one of the finest painters of the Siena school. He was trained by masters at Constantinople, the seat of the Byzantine Empire. Duccio was among the last artists in the Western Church tradition to paint such scenes in the Eastern/Byzantine style. The figure of Jesus wears the same red garment with blue robe that was used in Duccio’s painting of the Raising of Lazarus. The craggy, grey mountains and the splayed feet of the figures are typical of the Byzantine style, prevalent before it was supplanted in the West by a more anatomically-correct representation of the human form. The Eastern style still offers a sense of spirituality not present in the modern Western styles. I hope that if you cannot attend an Ash Wednesday service, you take the opportunity to listen to the commentary on the Collect for Ash Wednesday found in the first minute of the Podcast Homily. Here in Richmond, most Ash Wednesday services have been cancelled owing to the snowfall and the expectation of more to come this evening. Thanks for your interest and your support for the Anglican Internet Church online ministry.